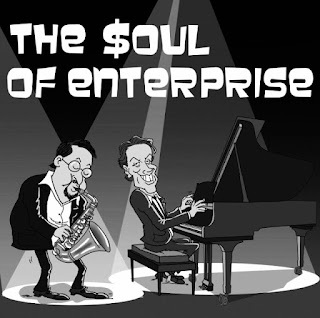 Many would be aware of our passion for up front, guaranteed fixed pricing rather than the traditional time-billing model of most law firms – previous posts explore this in more detail http://blog.viewlegal.com.au/search/label/fixed%20pricing. Together with 2 leading Australian based members of the VeraSage community John Chisholm (see - https://www.linkedin.com/in/chisholmjohn) and David Wells (see - https://www.linkedin.com/in/david-wells-a27a2011) I was fortunate enough to appear on the show, exploring the excellent Richard and Daniel Susskind book from 2015 ‘The Future of the Professions’ – see - http://www.amazon.com/The-Future-Professions-Technology-Transform-ebook/dp/B010N9QJ5M. We began the journey to address many of the challenges the Susskind’s have identified over 10 years ago. For many, the journey has started more recently and we believe it important to share our learnings. Our upcoming roadshow (see - http://viewlegal.com.au/roadshow-interest/) is another example of this. 5. What’s next and what’s now for professional service firms – by starting at the start and choosing a business model that sells value; not hours chalked up. As set out in earlier posts, and with thanks to the Television Education Network, today’s post addresses some of the key issues from the Clark v Inglis decision (please email me if you would like a copy of the case) and trust splitting in a ‘vidcast’ at the following link - https://vimeo.com/143343257. Clark v Inglis was focused on an estate planning exercise. As part of that estate planning exercise, there was a standard family trust under which the main asset was listed shares sitting inside the trust that overtime had grown significantly in value. As part of that estate planning exercise, there was an asset revaluation reserve undertaken by the trustee of the trust. As part of that asset revaluation reserve, and as part of the overall estate planning exercise, there was a distribution on paper effectively of that increase in value of the shares to the person who was actually making their will. Glossing over some of the facts and the key issue as it relates to trust splitting, what happened under the estate planning exercise was that firstly, the trustee company, and therefore the control of the trust went to the kids of the willmaker from his first marriage (i.e. marriage No.1.). However the big debt that was outstanding between the trust and the deceased person went to wife No.2. The core issue was - was it a valid exercise of trustee’s discretion to revalue those assets and then notionally distribute them out? If that was valid, what was the terms of the loan whereby the willmaker effectively was lending that money back into the trust and was that loan repayable by the trustee company into the estate and therefore passing to the second wife? Obviously, there was quite a lot of tension between wife No.2 and kids from the first relationship. 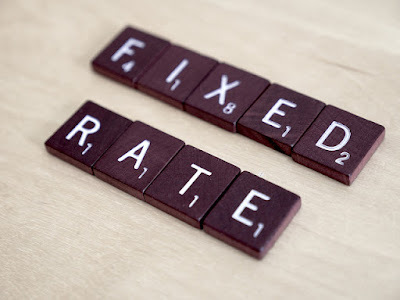 The key take outs in the context of the trust splitting exercise were that yes, the arrangement was entirely valid; yes, the loan was outstanding and formed an asset in the estate; and yes, it was repayable on demand to the second wife. 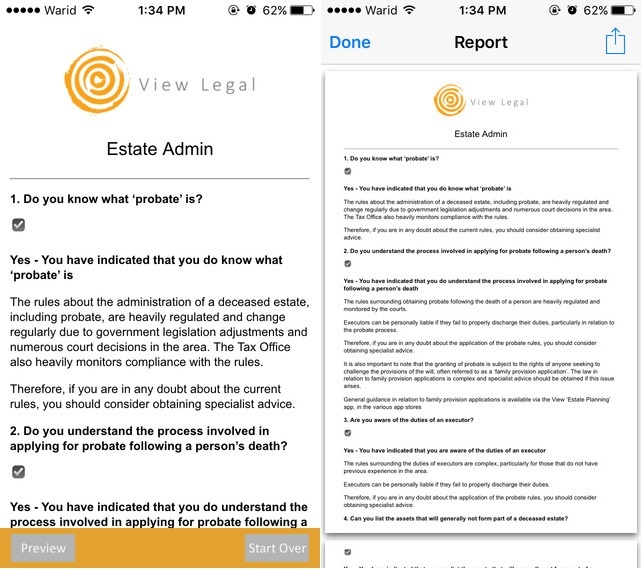 Following the successful launch last numerous previous View Legal apps (in areas such as estate planning, business succession and SMSFs), we have now developed and launched another Apple and Android app. The administration of a deceased estate is a heavily regulated area and there are many aspects that can cause irreversible damage if misunderstood. 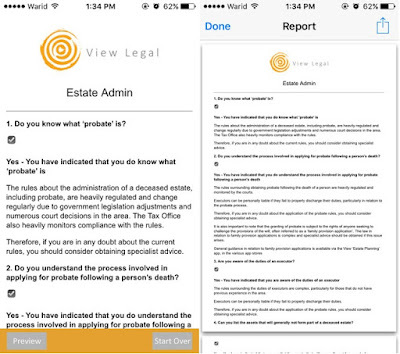 The View Legal Estate Admin app is designed to allow the user to narrow down some of the broad areas that might be relevant in relation to the administration of any deceased estate.